Homemade fried chicken strips tossed in a dare-worthy spicy chili oil. These are addictively spicy, but get ready to sweat! 1) For hot chili oil, combine ingredients in a small saucepan over low heat. Heat until warm and sugar is dissolved. Watch carefully or it will burn. Once mixed thoroughly remove from heat. Stir well before using. 2) For chicken, cut chicken into long strips. Whisk eggs and stir together flour, salt, and pepper. 3) Dip chicken strips in flour, then eggs, then again in flour. Set coated strips on a plate or wire rack and finish all the strips. Let the strips rest for a few minutes so the crust can form on them. 4) Preheat oil in a large cast iron skillet or large pot until it reaches 350 degrees F.
5) Fry chicken strips for 6-7 minutes until they are cooked through and golden brown. If you’re using a shallow skillet, you may have to flip them halfway through. That’s fine. 6) Let fried chicken strips drain for a minute on a paper towel and then move them all to a large bowl. 7) Stir chili oil well and drizzle it over the chicken. Start with a small amount as it is very spicy. Adjust to your liking. 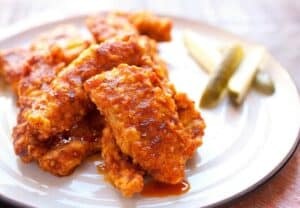 Serve chicken immediately with pickles and any dipping sauces you like! Chili oil recipe adapted from Hatty B's recipe. This delicious recipe was brought to you by Macheesmo. Read the full post at https://wp.me/pkSYO-duq.